A Signature Iron Gate is the start to a perfect welcome to your home. Signature Iron Doors is leading the iron door industry. Every piece is hand forged by certified welders. 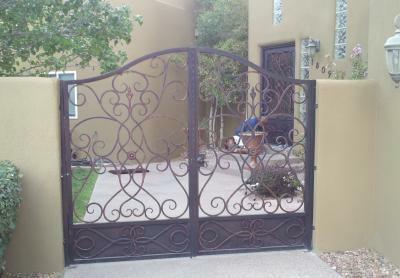 This is a gate we did for a customer in Albuquerque New Mexico. Our designers worked with them to come up with a design that fit their vision and produced the Signature Iron Gate leading to their Signature Iron Entry Door. We look forward to every project and love producing pieces which complement each other and you and your home. Call us to discuss with a sales representative about how you can obtain a Signature Iron Gate for your home.